In September 2009, two US fighter jets bombed a large group of people and two tanker trucks on a sandbar in the Kunduz River in Afghanistan. More than 100 people were killed or injured. ECCHR supports a criminal investigation in the matters and supports the affected persons' compensation claims. More than 30,000 people fell victim to the military dictatorship in Argentina (1976-1983). The victims included around one hundred people with German citizenship or German roots, among them Elisabeth Käsemann. In the Mercedes Benz case ECCHR is assisting relatives of trade unionists who disappeared from a Mercedes Benz plant in Buenos Aires. A senior manager at the company stands accused of involvement in the disappearances and murders of trade union activists carried out by Argentine security forces. A few months before the collapse of the Rana Plaza factory in Dhaka, TÜV Rheinland audited the production facilities at textile producer Phantom Apparel Ltd as part of a social audit. ECCHR argues that TÜV Rheinland ignored professional auditing standards. On the initiative of ECCHR the Hamburg Consumer Protection Agency filed an unfair competition complaint against the German discount retailer Lidl for claims made in the company's advertisements about fair working conditions in their supplier chain. In the course of a military action in Gaza in 2014, Israel's armed forces killed, among others, members of the German-Palestinian Kilani family. Israeli legal authorities have refused to investigate. ECCHR, on behalf of Ramsis Kilani from Germany, demands that Germany investigate the case. Bayer CropScience sells highly toxic pesticides in India. The company fails to ensure that consumers are adequately informed of both the dangers of pesticides and the requisite protective measures. The 18 minute video from Forensic Architecture details the lack of stairs, emergency exits, fire extinguishers and fire alarms in the factory. Inadequate fire safety measures at the company, a supplier for the German clothes retailer KiK, led to the agonizing deaths of 260 factory workers in the blaze. ECCHR has been able to invite colleagues from international partner organizations to come to Berlin for a set period of time as part of an intensive exchange of experiences and know-how. Bertha Global Exchange Fellows are actively involved in ECCHR's day-to-day work and contribute to issues and cases that their sending organizations are also working on. With the help of the Bertha Foundation ECCHR has the capacity to offer two-year fellowships to particularly qualified candidates from our alumn*. Bertha Justice Fellows are part of the global Bertha Justice Network comprised of organizations whose goal is to enforce human rights by legal means. Since the establishment of ECCHR in 2008 nearly 400 young human rights lawyers from more than 40 countries have participated in our Critical Legal Training. Together they constitute our alumni group, and their numbers are now into the hundreds. Following the symposium "Colonial Repercussions" in January 2018, a delegation from ECCHR was invited to Namibia for the commemoration of the genocide (1904-1908). Together with ECCHR, those affected by (post-)colonial injustice talk about their fight for the regocnition of their rights and what they expect of the German goverment. The event series in Namibia attracted remarkable interest from a broad variety of civil society actors. Topics were the German genocide against the Ovaherero and Nama peoples (1904-08) and ways forward for addressing these past wrongs in a dignified manner. Transnational corporations' responsibilities also extend to the working conditions in their subsidiary and supplier companies abroad. This position is supported by survivors and relatives of victims of the fatal fire at the Ali Enterprises textile factory in Karachi. Together with ECCHR, they filed a legal action for compensation against KiK. The Varvarin court proceedings in Germany concern the bombing of a bridge in rural Serbia as part of the NATO Operation Allied Force during the Kosovo war. Since 1999, those affected by the attack have been seeking compensation from the Federal Republic of Germany. 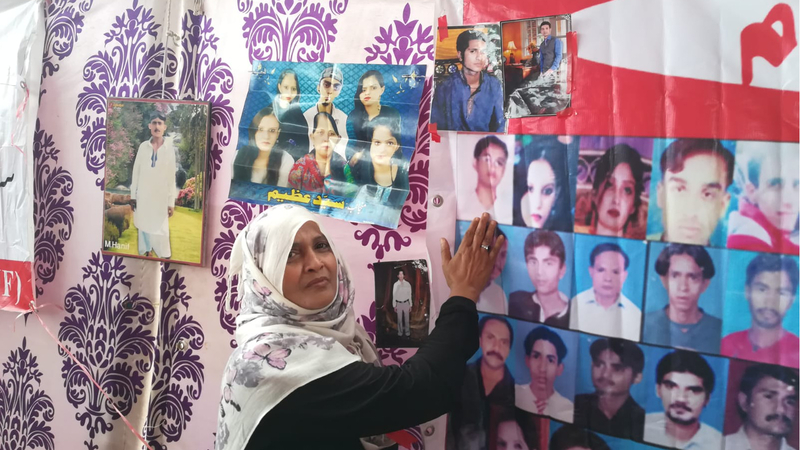 Ever since the final stages of the Sri Lankan civil war in 2009, issues of the criminal accountability for war crimes, crimes against humanity and the ongoing sexualized violence against women have been part of ECCHR's work. British-German surveillance technology provider Gamma infringed on its human rights obligations with products such as 'state trojan' FinFisher. This was confirmed by the UK's OECD National Contact Point. In 2013, ECCHR submitted a complaint against Gamma and German firm Trovicor. ECCHR has appealed to five UN Special Rapporteurs on behalf of two injured demonstrators who were shot by security forces during the Egyptian protests in spring 2011. ECCHR is calling for adequate support to be given to the men and their families. ECCHR and its partner organizations urged the FAO/WHO in an open letter and monitoring report to implement urgently needed changes to effectively address the widespread mismanagement of pesticides worldwide. Research by ECCHR showed: Syngenta's Gramoxone – which is banned in many countries including throughout the EU – is used on plantations in Indonesia and the Philippines with almost no protective measures. Networks and partnerships excel when expertise and practical experience are shared. With this in mind, ECCHR regularly hosts workshops and exchanges on transnational human rights litigation. In October 2010, ECCHR, along with Theo van Boven filed two amicus curiae briefs before Argentinean courts. The briefs support four different cases in the trials regarding sexualized violence in detention centers during the military dictatorship. In 2011, ECCHR submitted an amicus curiae brief in the criminal investigation examining sugar company Ledesma's liability for human rights violations during the Argentine military dictatorship. In 2012, ECCHR submitted a legal brief in the case relating to the unlawful detention and torture of workers of the company Minera Aguilar S.A. during the Argentine military dictatorship (1976-1983). ECCHR sent an advisory opinion to the Bahrain Independent Commission of Inquiry. The statement seeks to draw the commission's attention to the cases of two persons who suffered severe injuries when they were shot at by Bahraini security forces before being forcibly removed from hospital, imprisoned, and abused. Torture of detained members of the opposition: London High Court accepted in 2014 that Bahraini Prince Nasser bin Hamad Al-Khalifa is not immune from prosecution. This decision opened the door to an investigation by the Metropolitan Police War Crimes Team. Bahrain-born British citizen Jaafar al-Hasabi submitted a criminal complaint in Dublin against Bahraini Attorney General Ali Bin al-Buainain. Al-Hasabi was detained and tortured in Bahrain in 2010. Since then, he tries to bring those responsible to court. The exchange with universities takes place through a number of different avenues, such as collaborative seminars on human rights issues or the participation of ECCHR staff in university courses. ECCHR is part of the Bertha Justice Network which is comprised of 17 organizations from all continents, Bertha Justice Partners, as well as Bertha Justice Fellows and alumn*. In a comprehensive study, ECCHR has examined whether European companies through their transnational operations cause or contribute to forced labor or other labor abuses along their supply chains and whether they can be held to account. The result of this work is reflected in the report "Accountability for forced labor in a globalized economy". Colonia Dignidad, founded by a German named Paul Schäfer in 1961, was a fortress-like German settlement in central Chile where grave human rights violations were committed over several decades. The former doctor of the Colonia Dignidad, Hartmut Hopp, should face prison in Germany. ECCHR advises in the case of the German victim of a drone strike in Pakistan: Bünyamin E. According to ECCHR's examinations, the case raises a number of serious doubts as to the application and interpretation of the law and shows insufficient investigations. Italian audit company RINA certified a Ali Enterprises (Pakistan) building shortly before a fire broke out in the factory. The certificate failed to guarantee high standards of security. ECCHR is lending support to the legal proceedings underway in Pakistan, Italy and Germany. The group around the former Syrian military police employee 'Caesar' took for the first legal action by filing together with ECCHR a criminal complaint against senior officials from the Syrian intelligence services and the military police concerning crimes against humanity and war crimes. In Syria, the word Saydnaya has become a synonym for unimaginable torture, systematic degradation and mass executions. Together with four individuals who survived the torture in Saydnaya ECCHR has filed in Germany a criminal complaint against seven high-ranking Syrian military officials. "As the head of Syrian Air Force Intelligence, Jamil Hassan is responsible for the torture me and my friends suffered. The international arrest warrant shows, that our criminal complaint is the right path to achieve justice”, says Yazan Awad, a Syrian torture survivors who cooperates with ECCHR. The Syrian government led by president Bashar al-Assad is responsible for systematic and widespread torture. ECCHR together with seven Syrian torture survivors as well as the Syrian lawyers al-Bunni and Darwish submitted the first criminal complaint against six high-level officials of the Syrian military intelligence service to the German Federal Prosecutor. The Syrian intelligence services have been collecting without cause information about political opponents, members of the opposition and human rights activists. Spying often goes hand in hand with torture. Software from Western corporations may have played a role in the surveillance. In order to address this, transnational investigations have to be initiated. The Sigonella airbase in Sicily, Italy, is considered of strategic importance for US drone operations in North Africa. ECCHR has filed requests to access information regarding US drones located at Sigonella according to the Italian Freedom of Information Act. For several years now, ECCHR has been working on so-called "terrorism lists." The main focus of this work is to address the grave violation of basic constitutional and human rights that arises by identifying individuals and groups in such a process of listing. ECCHR supports claimants in a case of corporate crime in front of the US Supreme Court. The proceedings are a continuation of the high-profile case taken against Shell. The claimants argue that Shell, through its Nigerian subsidiary, aided and abetted crimes, including torture and extra-judicial executions. According to ECCHR's analysis of a series of admissibility interviews conducted on the Greek Islands, EASO fails to respect core standards of fairness. The interviews do not permit a fair assessment of cases and do not give room for a thorough investigation of vulnerability. ECCHR filed a criminal complaint against Nestlé and some of its top managers in 2012. The complaint accuses the managers of being in breach of their obligations by failing to prevent crimes of Colombian paramilitary groups and failing to adequately protect trade unionists from these crimes. With support from ECCHR, several refugees filed individual complaints against Macedonia in 2016. They assert that Macedonia's practice of unlawful expulsions is violating the European Convention on Human Rights. 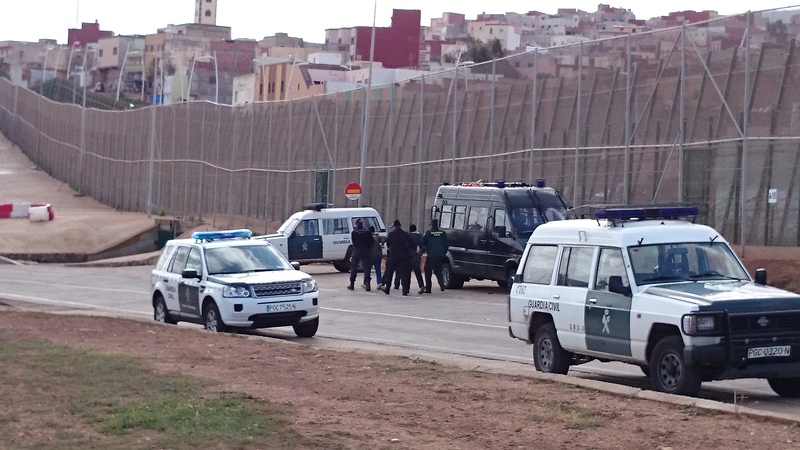 Spanish authorities systematically and often violently expel refugees and migrants at their borders. The long-standing practice of push-backs at the external borders of the European Union is unlawful, as the European Court of Human Rights ruled. ECCHR supports the claims of two refugees against Spain. ECCHR calls for individual compensation to be provided to Philippine survivors of sexual violence (so-called 'comfort women') during the Second World War. Already at the time of the Second World War, the systematic wartime enslavement of women by Japanese soldiers constituted a violation of international law. ECCHR demands investigations into the role and responsibility of British military officials in Iraq. A communication documents 2000 cases of grave mistreatment during the five years which UK forces operated in Iraq. With the Colonial Repercussions/Koloniales Erbe event series, the Akademie der Künste examined the structures of colonial power relations, which continue to impact on science, art and society today. The symposium 'Memory and Justice' at the Akademie der Künste in Berlin created a platform for interdisciplinary debates – spanning various epochs and regions – on legal proceedings, inquiries and other state responses to grave crimes and the extent of civil society participation in these processes. As part of a publication series on the topic of international economic law, Miriam Saage-Maaß, Vice Legal Director of ECCHR, co-edited a publication which is the result of a workshop at Humboldt University designed to give a platform to emergent legal scholars. Together with the Kreuzberger Kinderstiftung we offer young human rights lawyers with limited financial means the opportunity to gain professional experience in our day-to-day legal work. Eleven former Syrian employees of French company Lafarge submitted a criminal complaint against Lafarge. By having business relations with the terrorist group ISIS in Syria, the company may have taken part in the financing of the group, being therefore complicit in war crimes and crimes against humanity. At least 15 dead and many more injured: this is the outcome of a Guardia Civil operation on 6 February 2014 on the beach of El Tarajal, located at the border between Morocco and the Spanish enclave of Ceuta. The deadly push-back has still not been investigated properly. ECCHR is working with survivors who are willing to give witness evidence. The Spanish judiciary brought charges against judge Garzón, who declared his court competent to undertake preliminary investigations into the enforced disappearance, torture and execution during the Spanish Civil War and the Franco dictatorship. Garzón was acquitted of the charges later-on. It remains doubtful whether Spain is willing to independently adress the past atrocities. ECCHR criticizes the passing of a new law in context of peace negotiations with Colombian FARC. The law contains gaps, including those regarding military commanders' effective control over their subordinate units. General Padilla was General Commander of the Colombian Military Forces when the practice of 'falsos positivos' escalated. He is presumably responsible for international crimes committed by his subordinates, he neither prevented nor punished the wrongdoers. (Also) Sweden can play an important role in the fight against impunity for turture in Syria. This is why, in February 2019, nine torture survivors submitted a criminal complaint in Stockholm against senior officials in the government of Syrian President Bashar al-Assad – including for crimes against humanity. Sri Lanka must comply with its international obligations in the fight against gender-based discrimination. The country should bring its law in line with the UN Convention on Women. 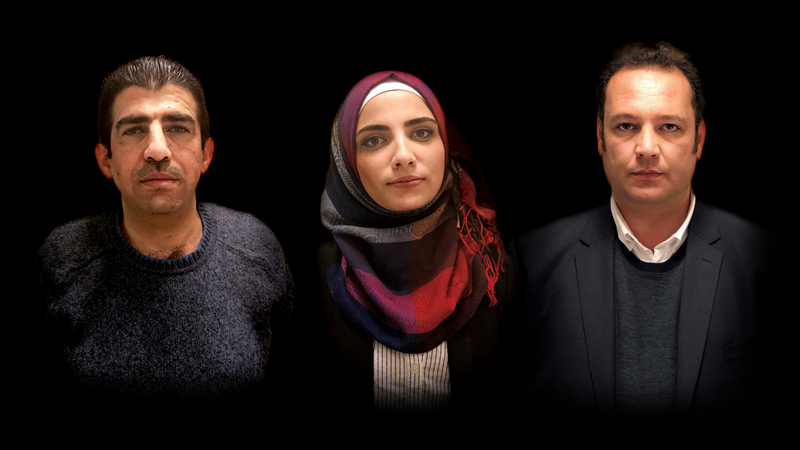 They survived torture and detention in Syria and fled to Europe, where they now hope to obtain justice. Austrian authorities should follow the example set in Germany, Sweden and France and initiate investigations into systematic torture under Syrian president Bashar al-Assad. Ramzan Kadyrov officially resumed office in 2007 as head of the Russian republic Chechnya. The Republic suffers from two armed conflicts against Russia. The recon­struction processes is proceeding under Kadyrov, however, there have been repeated human rights violations. The Russian Federation fails to investigate, prosecute and punish serious violations of women's human rights, particularly in response of allegations of violence regarding adherence to a campaign to enforce an Islamic dress code. Moroccan citizen El Haski was convicted to imprisonment in 2004 in Belgium for several offences committed with regard to an alleged terrorist group. At his conviction, witness testimony from Morocco was used which, according to El Haski, was procured by torture. "Namibia: A Week of Justice"
"Namibia: A Week of Justice" was the title of an event series organized by ECCHR together with German and Namibian institutions and organizations taking place from 25-30 March in Windhoek and Swakopmund in Namibia. Lawyers, artists, constitutional historians and civil society experts from Namibia and abroad discussed how to adequately address the German genocide of the Ovaherero and Nama peoples (1904-08). A central topic was international law in postcolonial contexts. In the case "Bin Ali Jaber vs. Germany," the Higher Administrative Court in Münster found in favor of the claimants from Yemen on key aspects. Germany must now take action to ensure that the US respects international law in its use of Ramstein Air Base. Ramstein plays a key role in US drone strikes and thus in many cases in the deaths of innocent people. In August 2012, the bin Ali Jaber family lost two relatives in a drone strike. The airbase at Ramstein hosts a satellite relay station as well as personnel that are crucial for drone operations in the region. This is why, in October 2014, Faisal bin Ali Jaber and two other members of his family brought a legal action against the German government. Following criminal complaints in Germany and Austria, torture survivors submitted a criminal complaint in Stockholm in February 2019 against more than 25 senior officials in the Syrian government. ECCHR, whose legal research and analysis form the basis for the criminal complaint, worked closely together with the plaintiffs, Syrian lawyers and Civil Rights Defenders from Sweden. In December 2014, D.D. was pushed back as an unaccompanied minor at the Spanish-Moroccan border – and this was no exception, but a common procedure. On 1 February 2019, the UN Committee on the Rights of the Child condemned Spain for its violent push-back practice. The decision followed a complaint submitted by D.D. together with ECCHR and Fundación Raíces in 2015. A former member of the Syrian General Intelligence Directorate was arrested on 12 February 2019 at the behest of the Federal Court of Justice. Anwar R. is suspected of being responsible for the torture of detainees in the Al-Khatib detention facility run by the General Intelligence Directorate in Damascus. This could lead to a criminal trial in Germany, which would be the first trial anywhere in the world examining the responsibility of senior members of the Syrian intelligence agencies of President Bashar al-Assad for crimes of torture. ECCHR is assisting survivors of torture in Syria in these proceedings. Their testimonies and research conducted by ECCHR contributed to the issuance of the arrest warrant. The Regional Court in Dortmund will not investigate the facts in the case against textile retailer KiK. In January 2019, the court rejected the lawsuit, which aimed to clarify KiK's joint responsibility for the fire safety deficiencies at a supplier factory in Pakistan, referring to a statutory limitation. KiK had initially agreed to waive a possible statutory limitation, but later insisted that this waiver was void.